Earlier this year, physics mourned the loss of a giant in the field when Professor Stephen Hawking passed away. Hawking needs little introduction due to his numerous pop-culture appearances and most of the tributes paid to him, quite rightly paid service to his force of will, his resolution not to let the terrible illness from which he suffered consume him and doom him to a premature death. Others highlighted his work to popularise physics bringing the most complex cosmological ideas to the layman’s coffee table in the form of his books. But one of the great ironies of Hawking’s death was that fact that his most revolutionary contribution to science, Hawking radiation, suggests that nothing in our universe can last forever. 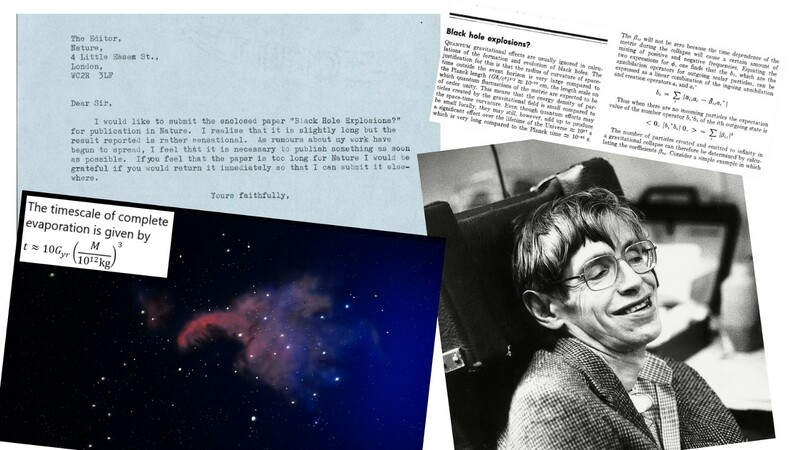 In the formulation of Hawking radiation, he showed us that even a different form of cosmological giants, black-holes, may eventually ebb away. In considering Hawking’s genius we will be exposed to a far crueller irony, the reason that one of the greatest minds in this era of science will never hold its greatest accolade, the Nobel Prize in physics. Before Hawking’s breakthrough, black holes were considered to be the endpoint of the lifetime of cosmological bodies like stars. 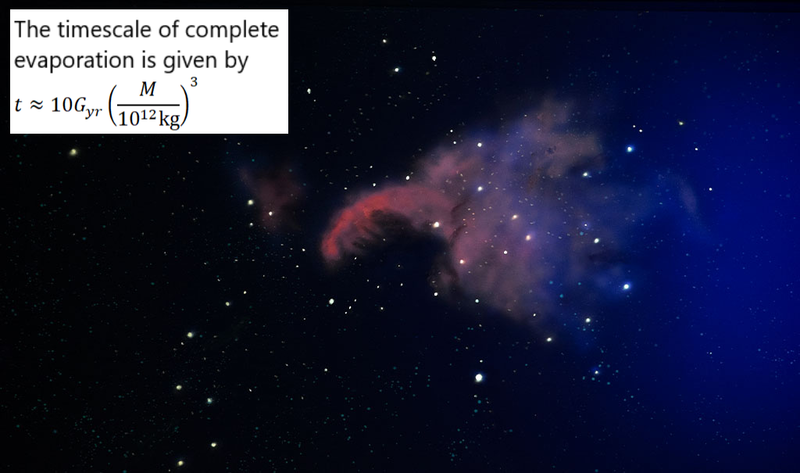 When a massive enough star ceased nuclear fusion, it is subject to a huge gravitational collapse and this was believed to signal the end of any form of radiative activity. The event horizon of the black hole was positioned as the universe’s ultimate ‘point of no return’ with not even light fast enough to meet the escape velocity required to avoid its grip. We now know that the environment around black-holes, especially those in binary systems is seething with violent events, such as the creation of gamma bursts exploding from accretion discs formed from material being ripped apart as it falls into the black hole. But the central object, the black hole itself, remained almost monolithic, only growing. Never shrinking. Perhaps even eternal. 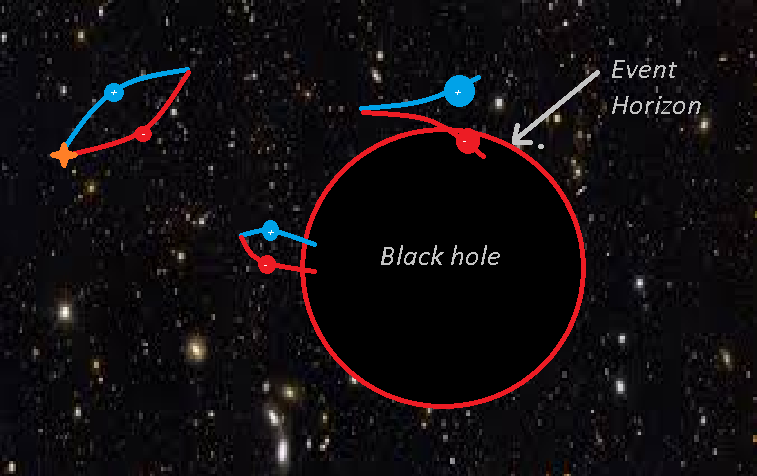 In a 1974 letter entitled ‘Black hole explosions?’ published in Nature, a young Hawking proposed that quantum effects, usually ignored in the formalism of black hole physics, could become significant in deteriorating mass over a period of approximately10¹⁷ s. As the mass of the black hole reduced, the effect of these quantum phenomena would increase leading to a more rapid deterioration. For small black holes, formed by fluctuations in the early universe, this may lead to evaporation, possibly even followed by a small explosion. The leaking of energy/mass in this way was to become known as ‘Hawking Radiation’. The key to understanding the gradual loss of mass from black holes leading them to evaporate requires we first examine one of the most extraordinary findings of quantum physics, the creation of virtual particles. Particles that literally appear from the vacuum of space itself. Virtual particles: Something from nothing. The common view of a vacuum is to consider it empty and inactive, but one of the key principles of quantum mechanics, the Heisenberg uncertainty principle and the intricacies of quantum field theory cast some doubt on this concept. To best understand this, we should briefly ignore the complexities of quantum field theory for the moment, as the Heisenberg uncertainty principle gives us a satisfactory, albeit incomplete, model to consider. Imagine we could isolate a small portion of space in a box of some kind and seal it for a very precise length of time. 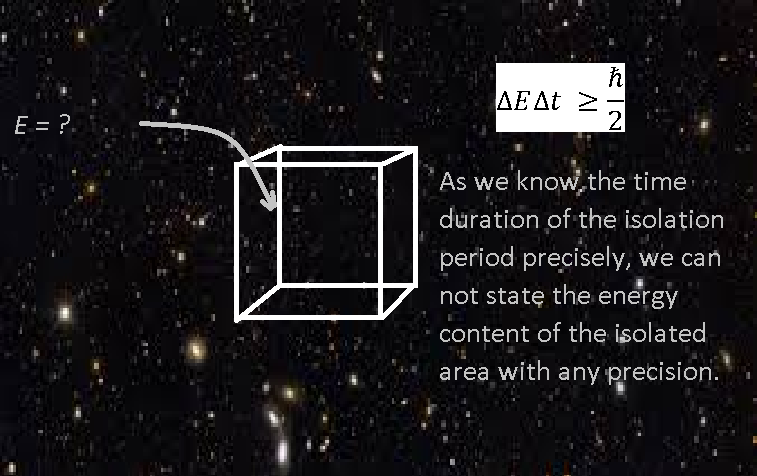 As we know the time-period of this isolation with little uncertainty, Heisenberg’s uncertainty principle demands a large uncertainty in the energy content of the box for this period. This means accepting the possibility that particles carrying energy appear and disappear within the box. But the conservation of energy and the idea that energy can neither be created or destroyed seemingly wouldn’t allow this. If the energy of this area was zero at the beginning of this period of isolation how could particles carrying energy simply appear? The answer is if the particles that appear from the vacuum do so in matter particle/anti-matter virtual particle pairs and then annihilate. These are known as ‘virtual particles’ as they exist for such a short period before annihilation with no chance of escape or observation. So, imagine the appearance of an electron with a charge of -0.511 MeV in the box. To ensure the non-violation of the conservation of energy an anti-electron, a positron, with a charge of 0.511 MeV must also appear. By analogy, the vacuum of space has an overdraft facility. It will allow particles to be borrowed, but only for a short period before the energy debt is ‘paid back’ via the process of annihilation. Quantum field theory states that these particles appear as the result of the disturbance of underlying quantum fields that inhabit the entire universe. Such a disturbance could be caused by space-time curvature which general relativity suggests should be most prominent around objects of incredible mass, such as black holes. Thus, we should expect these areas of space to be seething with pair creation and annihilation. This led Hawking to ponder, what would happen to virtual particles that began their existence at the event horizon of a black-hole? Hawking imagined the black hole surrounded by an aura of forming anti-particle/particle virtual pairs. What if one of this virtual pair were to fall into the event horizon of the black hole? This would, theoretically at least and with a small but finite probability, allow its partner to escape its annihilation and become ‘real’. This work was built upon by others in the field of cosmology such as Maulik Parikh and Frank Wilczek who suggested in a paper published in 1999, that these particles may escape the event horizon via the phenomena of ‘quantum tunnelling’ in which a particle ‘passes through’ a barrier of much greater potential energy than it possesses in kinetic energy almost as if it weren’t there. As a particle with positive energy escapes into the cosmos, the conservation of energy requires that ‘energy-debt’ is paid back to the universe by the black hole itself. This results in the black hole losing mass. Further to this Hawking discovered that due to particle pair creation at the event horizon, black holes must emit thermally as if it were a black-body (a perfect emitter and absorber of electromagnetic radiation) with a temperature proportional to the strength of the gravitational field on the event horizon, the ‘Hawking temperature’. Thus, showing that black holes may not be truly ‘black’ after all. Why does this mark Hawking out as a genius? The most remarkable thing about the development of Hawking radiation as a theory is that it required the combination of quantum mechanics and general relativity. This may not sound particularly challenging, but consider that there is currently no ‘quantum theory of gravity’ and general relativity is in essence purely a theory of gravity. In principle, the formulation of quantum effects of black holes and thus Hawking radiation should have required a ‘theory of everything’. This is something Hawking himself spent decades searching for, eventually relenting and admitting that the closest we may ever come to such an all-compassing understanding of the universe and of quantum gravity is M-theory, a complex theory comprised of five different ‘string-theories’ posited by Edward Witten in 1995. As such a uniting theory was non-forth coming, Hawking worked around the problem by employing a complex version of algebra created in 1958 by Nikolay Bogoliubov and John Valatin independently known as ‘Bogoliubov transformations’. This method approximates the effect of curved space-time on quantum fields by linking areas of flat space-time, therefore, eliminating the need to consider a true curved space. The idea of taking an unrelated, previously fairly obscure area of mathematics and using it to formulate a new discovery in physics marks Hawking out as a genius in a similar way that the use of tensor algebra to create General relativity does for Einstein. Although both men had ideas that could have been developed by others, it took an extraordinary leap and truly original, revolutionary thought to take these ideas from wild imagination to the textbook. As of the time of his death, we are unable to detect Hawking radiation and thus confirm its existence. The reason for this is predominantly that the only black holes we are capable of detecting at this point are those marked out by violent accretion events. The electromagnetic emissions from these events mark them out as the most luminous objects in the entire universe and therefore dwarfs what would be the almost imperceptibly faint emission of Hawking radiation. Hopefully, this situation will change due to the discovery of gravitational waves, which may in time allow us to seek out black holes in binary systems where such violent events are not occurring. There are also other questions regarding Hawking radiation that have yet to be answered, such as why does the model favour the escape of matter particles and the capture of anti-matter particles thus the loss of mass from the black hole? Answering this question may also in time provide an answer to why there is such a matter/anti-matter imbalance in our universe at all. This lack of observation means that Hawking never won a Nobel prize for physics during his lifetime and as the prize is not awarded posthumously, it will remain this way. This, perhaps, is the price of true genius. 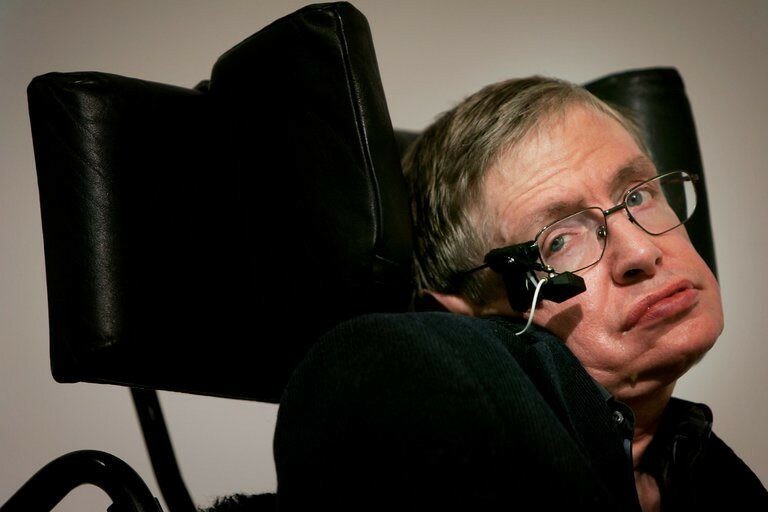 Hawking was a man so ahead of the developments around him that experimental verification of his theories may occur only decades after his lifetime. Indeed, just as many of the theories of Einstein were only experimentally verified decades after he passed away such as the recent the confirmation of the existence of gravitational waves almost 100 years after being first posited by Einstein. I have little doubt, that at some point in the future, a physicist or several, will win the Nobel prize for physics for confirming the existence of Hawking radiation. Perhaps this is not too surprising given the fact his life’s work strongly indicated that nothing lasts forever.